"Portrait of the Mennonite preacher Cornelius Claesz Anslo and his wife Aeltje Gerritsdr Schouten" by Rembrandt, 1641. Cornelis Claesz Anslo, who was born in Amsterdam in 1592 and died there in 1646, was the fourth son of Claas Claasz Anslo. The latter was born in 1555 in Anslo (now Oslo), Norway, and assumed the name of the city; he died in 1632 in Amsterdam, where he settled in 1580. Claas Anslo married Geertgen Jans in 1582 and was a preacher of the Waterlander Mennonite congregation. He was a cloth merchant and founded the Anslo-hofje (home for the aged). By 1845 it had fallen out of use, the original buildings demolished and new ones erected in their place. In 1955 the Stichting Diogenes spotted the "huis met de schrijvende hand" (house with the writing hand) at Eglantierstaat 52. After restoring that building, the Stichting turned its attention to the Anslohofje next to it. In 1965 they reconstructed the original buildings based on drawings and the way support beams were placed in the buildings behind. The restored Anslohofje was reopened in 1969. Cornelis Anslo became a Waterlander preacher on 14 July 1617. Schijn calls him a very earnest, pious, upright and intelligent preacher. His wealth enabled him to give liberally to the poor. In 1625 he became involved in a violent dispute with a fellow preacher, Nittert Obbesz, and published against him the pamphlet, Dialogus of Zaamenspreekinge tusschen eenen waarheidszoekenden Neutralist genoemd Vrederik en een waterlandschen broeder (Hoorn, 1626). Among his friends were Joost van den Vondel, the great Dutch poet, and Rembrandt. Vondel wrote a poem for two weddings in the Anslo family: that of Gerbrand Anslo (son of Cornelis) in 1636 and that of Gerbrand's daughter Alida in 1658. Rembrandt painted several portraits of him. 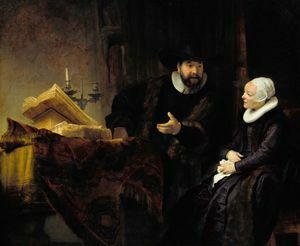 The widely known painting, "The Mennonite Preacher C. C. Anslo and a Widow" (or his wife), was purchased by the Prussian government for a large sum and hangs in the National Gallery of Berlin. An etching of the same subject is in the Chicago Art Institute and one of Anslo alone is in the Fogg Museum of Art at Harvard University. The following verse by Vondel is about Anslo. Ay, Rembrandt maal Cornelis' stemm! Die Anslo zien wil, moet hem hooren. ("O Rembrandt, draw Cornelis' voice! Whoever looks at Anslo's picture, his heart is deeply moved by the fiery zeal evident in his eyes; yet could a brush make his voice heard, everyone's heart would be converted to virtuous living. Hege, Christian and Christian Neff. Mennonitisches Lexikon, 4 vols. Frankfurt & Weierhof: Hege; Karlsruhe: Schneider, 1913-1967: v. I, 74. Hesta, L. "Cornelis Claesz Anslo." Christlicher Gemeinde-Kalender (1898): 82-85 (with reproduction of the Berlin painting). Kühler, Wilhelmus Johannes. Geschiedenis van de Doopsgezinden in Nederland II. 1600-1735 Eerste Helft. Haarlem: H.D. Tjeenk Willink & Zoon n.v., 1940: 1, see Index. Müller, J. W. "De naam Anslo." Tijdschrift voor nederlandse taal- en letterkunde 48: 225-232. Rotermund, H. M. "Rembrandt and the Mennonites." Mennonite Life 7 (1952): 7-10. ThisAmsterdam. "Claes Claeszhofje." http://www.thisamsterdam.com/atoz/claes_claeszhofje.php (accessed 20 March 2009). Vos, Karel and Sam Steiner. "Anslo, Cornelis Claesz (1592-1646)." Global Anabaptist Mennonite Encyclopedia Online. 2009. Web. 23 Apr 2019. http://gameo.org/index.php?title=Anslo,_Cornelis_Claesz_(1592-1646)&oldid=144722. Vos, Karel and Sam Steiner. (2009). Anslo, Cornelis Claesz (1592-1646). Global Anabaptist Mennonite Encyclopedia Online. Retrieved 23 April 2019, from http://gameo.org/index.php?title=Anslo,_Cornelis_Claesz_(1592-1646)&oldid=144722. Adapted by permission of Herald Press, Harrisonburg, Virginia, from Mennonite Encyclopedia, Vol. 1, p. 129. All rights reserved.